EllynAnne Geisel started Tie One On Day after she saw how much joy her gift of a baked good wrapped in an apron brought her neighbor who was dealing with hardship. Her apron collection never stops growing. 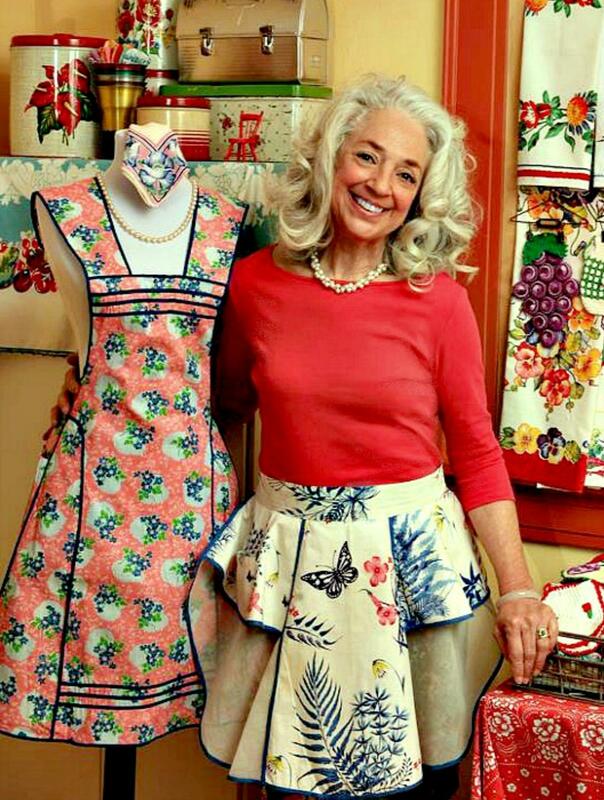 EllynAnne Geisel says she still gets aprons in the mail, but has also gotten to the point where she has so many she will give them away and let the new owners know the history behind each as they tie it on. Geisel wrote The Apron Book in 2006, after many years as a successful, full-time homemaker. The book, an update of which has just been reissued, is a celebration of aprons — their many patterns and uses, and stories from enthusiasts about the roles aprons have played in their lives. But early in her life, Geisel says she didn't have much experience cooking and was worried about her abilities. The day of her wedding, she says her husband's aunt "gave me the 1975 edition of The New York Times Cookbook with a tucked in note that suggested if I could read, I could cook, and she had faith I could read. She was right, and 42 years later, her note still carries much wisdom." When her children left the home, she says she decided she wanted to try a new job as a writer. Her first subject would be the apron "as the icon symbolic of my homemaking years." Adding to those she already had, Geisel started to collect aprons of all kinds, taking time to notice the different patterns, fabrics, designs, accents and most importantly, the stories behind each one. "Using the apron as inspiration, I felt a connection to the women of earlier generations who'd tied one on ... as daily domestic armor," Geisel wrote. "I began to collect their aprons, their household linens, their kitchen utilities, their cookbooks and recipe boxes." After she started writing about aprons and their history, Geisel says she received a letter sent with a "black checkered chef style apron." "The writer was the niece of a housekeeper, who had worked for a famous cookbook author for many years. One of her duties was to maintain his aprons, which were serviced by a dry cleaner. Upon his death, she was allowed one item as a remembrance. She took an apron, which the niece eventually acquired. The apron, she wrote to me, was meant to be mine, for she didn't cook and better than to toss it, she was giving it to me. There's a dry cleaner's twill label sewn to one of the apron's ties, a name stamped upon the twill." The apron's owner was none other than Craig Claiborne, the author of that New York Times Cookbook that had gotten Geisel started in the kitchen. Geisel still gets aprons in the mail. They come from all over with notes about whom the original owners were and what time period they were used. But as much as Geisel is overjoyed when she gets a new apron, she is also exuberant when she can give one away. She realized this 12 years ago around Thanksgiving time, when she wrapped a baked good into the apron along with a note and gave it to her neighbor who was dealing with a hardship. After she saw the joy it brought her neighbor, Geisel started Tie One On Day on the day before Thanksgiving. She says it's a way for people to continue to pass on the kindness to their neighbors through aprons, baked goods and heartfelt notes. But even when it's not Tie One On Day, Geisel is spreading her love of aprons. Her collection has grown so large that she is able to rotate aprons in and out of her traveling exhibit, "The Apron Chronicles." She also gives out aprons to the women in her life and to strangers she meets, or sometimes doesn't meet. Geisel attaches notes in which she tries to give some of the apron's history to its new owners. "I relate aprons and voices," Geisel says. "I think the women's voices are woven into the fabric, and it's their spirit when you tie it on — you bring them back. I will never grow tired of that vision."